We are sitting in Le Pain Quotidien on Madison Avenue up near the middle of Central Park, having spent the morning wandering around through the park. We've just had lunch and I am about to go back to the hotel to get ready for the ISO meeting which begins at 13:30. We slept in this morning until 07:00. I slept much better than the last two nights, and could have slept more. The breakfast room was busy, and we were lucky to get a table, where I had cereal again and an apple. The bananas here are not good - they are greenish, but also with brown spots, and the fruit is mushy. Maybe they keep them in the fridge or something. So I've decided to stick to apples from now. M. had some corn flakes and a toasted bagel with cream cheese. The first order of business was a trip to Central Park. We walked north from our hotel, but stopped briefly at Rockefeller Plaza to find the Blue Bottle coffee shop which M. had searched for online after seeing people walking down the street carrying take away cups with their logo on them. She reckons it's the best chain store coffee she's found in the US. 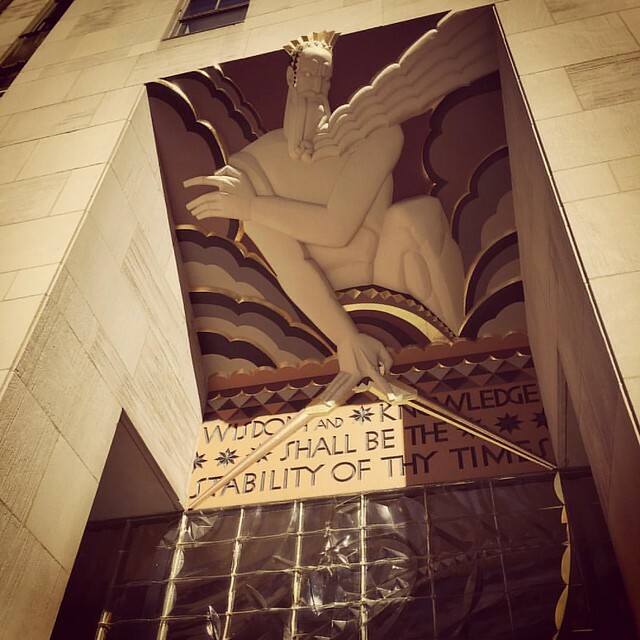 We also saw the Lego shop there at Rockefeller, as well as the NBC building at 30 Rock. They were actually filming something for the Today Show in the southern section of the plaza, with a crowd of people holding signs and making noise. Grandy Army Plaza and the Plaza Hotel. Eventually we reached Grand Army Plaza, which has the same name as the other Grand Army plaza we saw in Brooklyn earlier, but is a different place here in Manhattan. 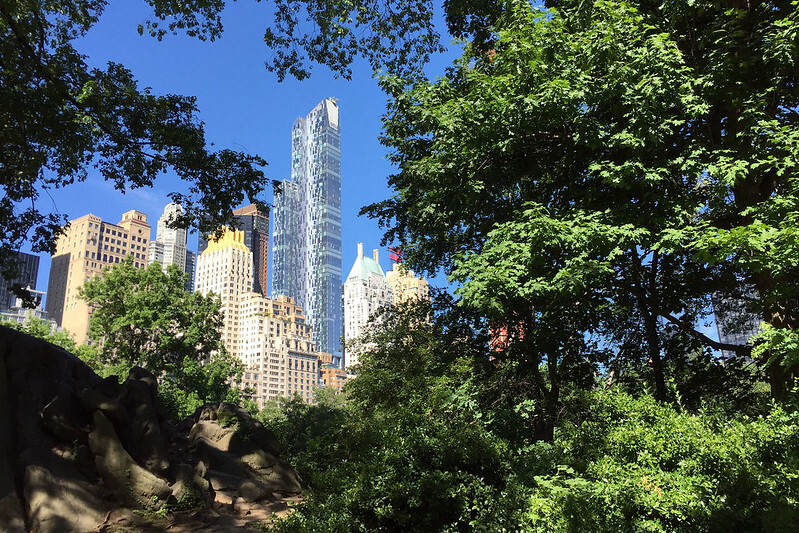 It's a couple of small blocks at the south-east corner of Central Park, the northern one actually cut out of the otherwise rectangular shape of the park. The southern block contains a fountain, while the northern block contains an astonishingly shiny gilded statue of General William Tecumseh Sherman, mounted on a horse. 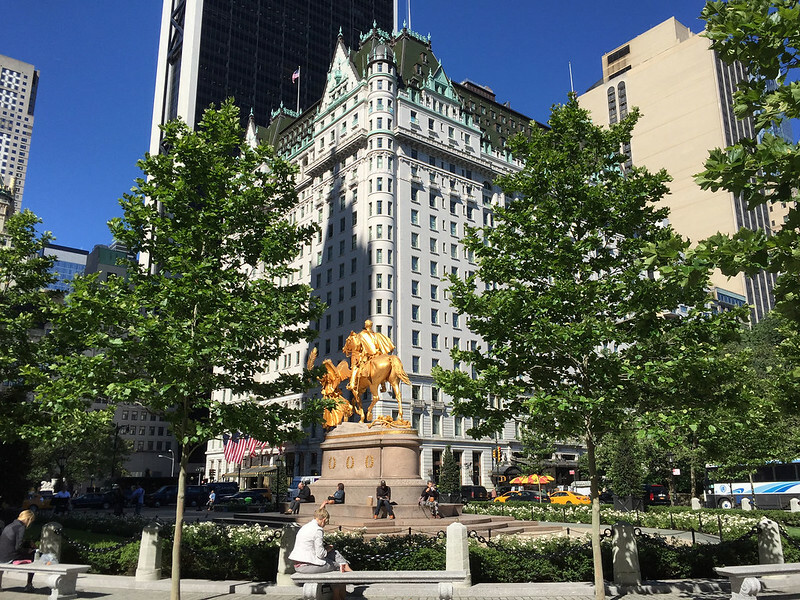 South of the plaza is the Plaza Hotel, and east of it the spectacular old brick Sherry-Netherland Hotel. Manhattan buildings, from Central Park. Past the plaza, we entered Central Park and took a path in, winding our way slowly northwards and admiring the scenery along the way. The terrain in the park is surprisingly hilly, making a huge change to the utterly flat streets of Manhattan. There were lots of joggers, doggedly going up and down the hills, perhaps as a refreshing change from walking on flat ground all the time - the complete opposite of me seeking out flat ground to jog on because I don't want to run on all the hills surrounding our place. There are lots of large leafy green trees, and bare outcrops of rock sticking through the grass in places. A lot of the trees seem to be elms, judging by the number of signs asking people to protect the elms by staying away from them. There were smallish squirrels all over the place, and lots of birds. It was very nice hearing the sounds of birds rather than traffic. We were there quite early, and there weren't very many people around. There were some setting up stalls to sell food or drinks, or souvenir artworks or things like that. Early on we saw what looked like a small amusement park in the distance. We also passed a concert shell, where roadies were setting up for a concert to be played later in the day. It looked like a classical concert, as there were seats for a small orchestra. At one place there was a cohort of what we assumed to be volunteer workers, cleaning garden beds and planting new plants. Bethesda Fountain and The Lake, from Bethesda Terrace. 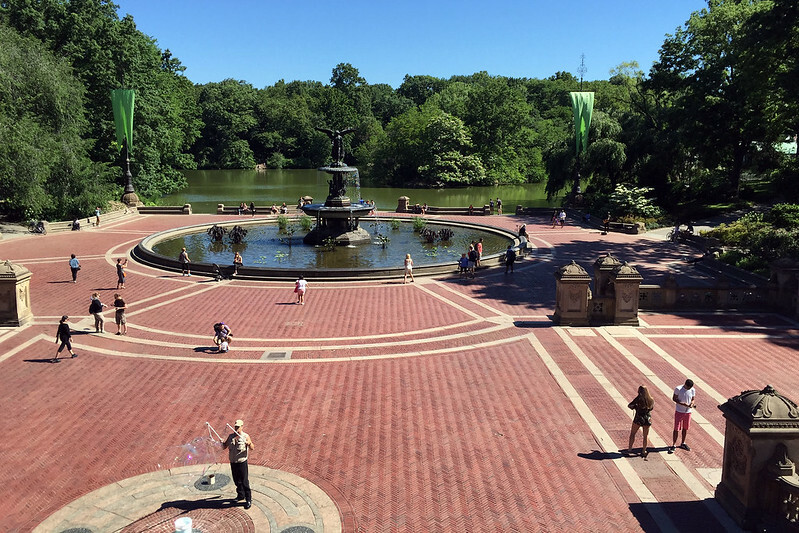 After a while we came across the Bethesda Terrace and Fountain, which look out over The Lake. Many people were here, enjoying the sunshine and the views, as well as some people busking and one guy making huge soap bubbles, which the children in the area were enjoying. We spent some time exploring the area, then walked around the Lake on the eastern side, passing an area where you could hire boats to row on the Lake, and then a restaurant, function centre, and cafeteria. The restaurant had large glass windows looking out onto the Lake, and is presumably a very expensive wedding reception venue. 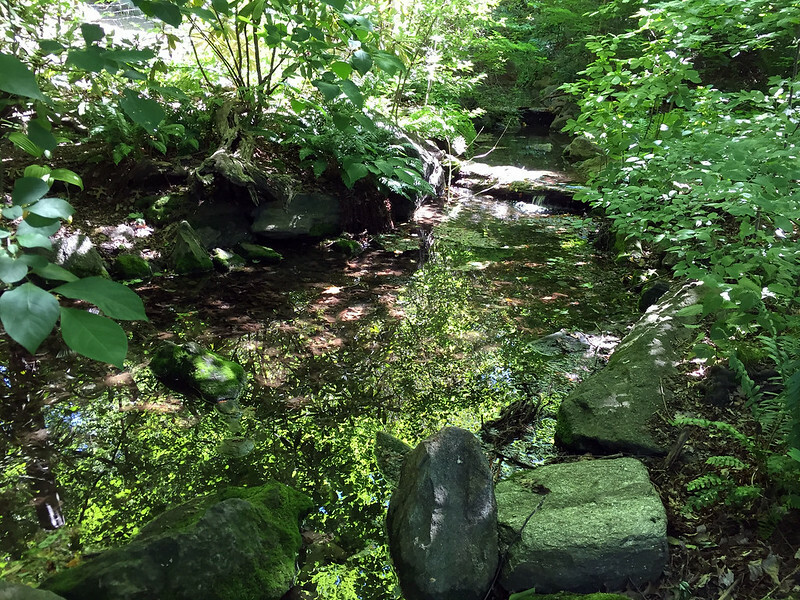 A stream in The Ramble. From here we walked through The Ramble, taking some rock and dirt paths through the thickly packed trees, seeing lots of birds along the way. This led us to the Belvedere Castle, a small stone edifice perched atop a rocky cliff overlooking a pond which contained dozens of tortoises. These were sunning themselves on rocks, swimming in the water, and generally over the place. From the Belvedere we walked back south a bit to see the Alice in Wonderland statue. 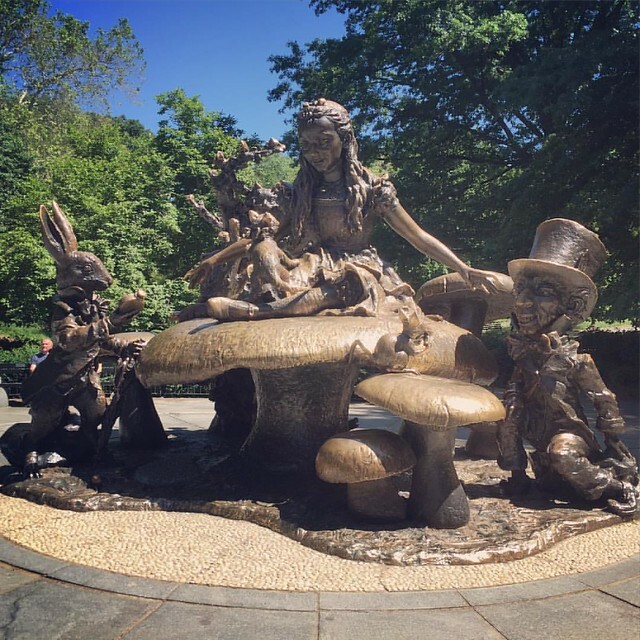 We were both expecting this to be a group of statues scattered across an area, but it turned out to be one massive bronze sculpture containing all the major characters arrayed across a group of giant mushrooms, and the whole thing was much larger than life size. When we arrived, there was a tour group of school students there, busy taking photos of each other climbing on the sculpture. So we had to wait a few minutes until they left to get a clean shot of the sculpture. I also got M. to sit on a giant mushroom so I could get a photo of her with it. 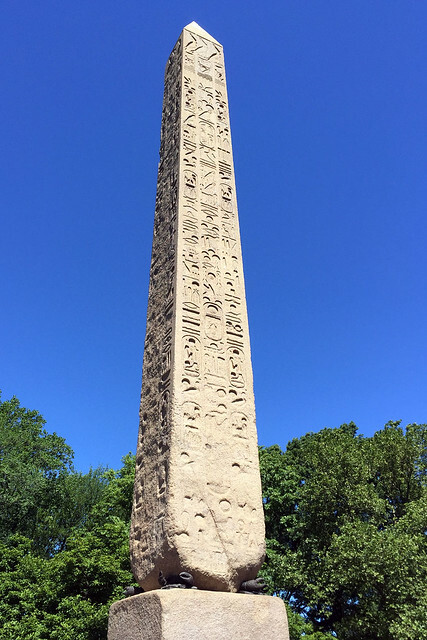 "Cleopatra's Needle", actually an Obelisk of Thutmose III. Next we walked up towards the Metropolitan Museum of Art (a.k.a. "The Met"), which is a huge building, though rather undistinguished and ugly from the outside. Around the back we stopped off at "Cleopatra's Needle", an ancient Egyptian obelisk which was installed therein 1881. An informational sign said that it was actually commissioned by Thutmose III, in about 1500 BC, a good one and a half thousand years before Cleopatra. Julius Caesar's troops had found it, and another similar one, half buried in sand at Heliopolis, and had them moved and erected at Alexandria. The Romans had added four bronze crabs, wedged into the decayed corners of the base as a way to ensure the pillar was stable. The whole lot was moved to America in the 19th century, and acquired by the Met, who erected it in its current position. The hieroglyphic carvings on the faces of the obelisk are in various states of decay, from almost obliterated on one side, to almost perfectly preserved on the opposite face, with a gradation on the other two sides. This is attributed to the partial burial while lying sideways in the Egyptian sand. 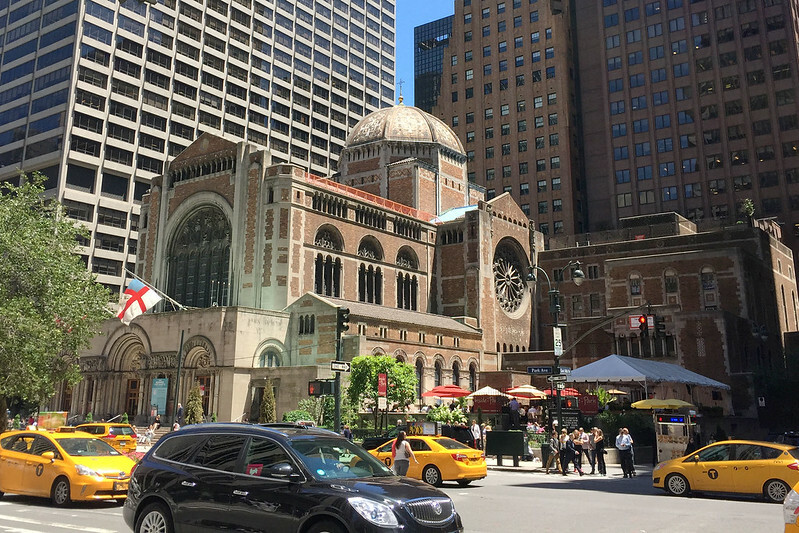 We emerged from the park just north of the Met, and crossed over to Madison Avenue. There we found another Le Pain Quotidien, where we stopped for a slightly early lunch for me, since I had to leave to be back in time for the ISO meeting to start at 13:30. M. just had a chocolate and salted caramel tart, while I had a sandwich with chicken and smoked mozzarella, served open faced in a single large slice of wholemeal sourdough bread and drizzled with pesto. It was pretty good. 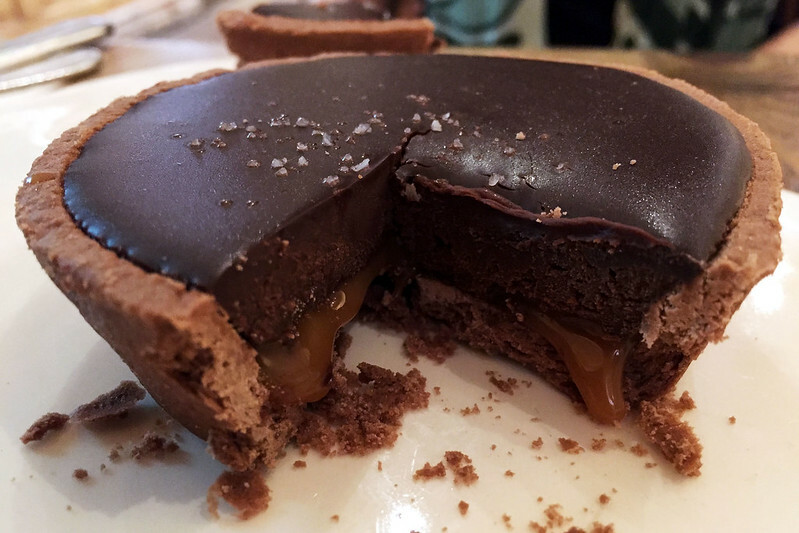 Chocolate and salted caramel tart. After eating, we parted ways. M. went to walk down Madison Avenue, while I crossed over to Lexington Avenue to take the subway back downtown to our hotel. There I changed from shorts into more business-like trousers and picked up my laptop computer, before heading out to the ANSI offices for the ISO meeting. This was in an office building just a couple of blocks away, between our hotel and Bryant Park. I entered and went up to the fourth floor, where there were several of the committee members waiting to sign in. The ANSI offices are squeezed in an old building, with narrow corridors and awkwardly shaped rooms, filled with ancient looking office furniture - vintage 1970s or so. After greetings and everyone settling in to seats around the rather crowded table, the meeting began. The first session was a lot of administrative details, with the technical discussions that form the guts of the meeting to happen from tomorrow. One item was the venue for the late 2017 meeting, which was previously tentatively set for Cologne in Germany, but the chair mentioned that he'd approached me about hosting in Sydney again, and a few people yelled out in favour of Sydney. So that seems like it should be successful if it can be arranged. 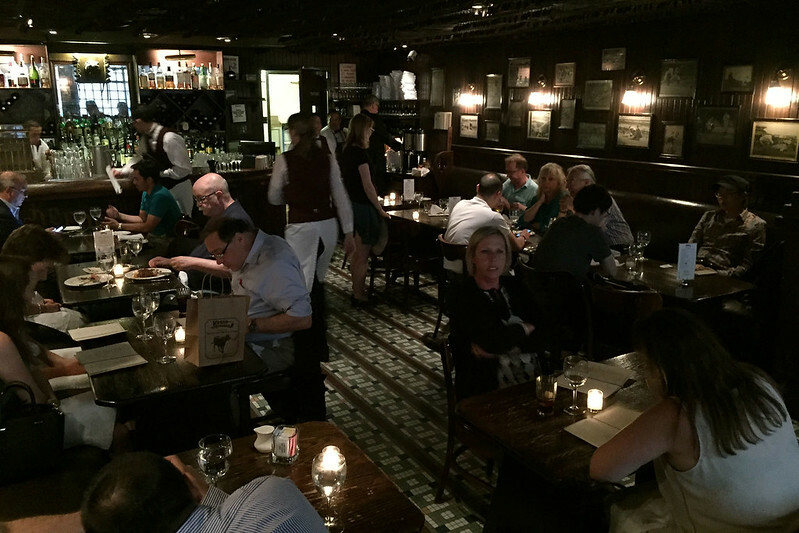 After the session ended, I arranged to meet Margaret and Jonathan at Keens Steakhouse, which is apparently a famous restaurant here in New York. They said I had to try the steaks there. Margaret tried ringing to make a booking for 19:00 or so, but they said they couldn't fit us in then, and suggested showing up at either 17:00 or after 21:30, and seeing if a table was free. We all agreed that the latter was too late, so decided on 17:00. I had to go back to the hotel to meet M. at 17:00, so said I'd be maybe fifteen minutes later, and they said they'd hold a table for us. M. returned a few minutes after 17:00, but wasn't feeling well and didn't want to go out for dinner. Since I had no way to message the others, and M. wasn't too bad, I left and raced down to 36th Street where Keens was, only to find Margaret waiting alone. She said that Jonathan had messaged to say he was doing something else with some friends, and Scott hadn't replied to her messages and she suspected he had gone home, since he lives locally, over in New Jersey. The restaurant was very historical looking and moody inside, with very dark wood panelling everywhere, and a huge collection of clay smoking pipes mounted all over the ceiling on and the walls. A prominent display frame held pipes that had belonged to such people as Theodore Roosevelt, Albert Einstein, Herbert Hoover, and a bunch of other more or less famous people. Back in the day, these pipes were too fragile to travel with, so people would leave a pipe at their favourite restaurants, and the restaurant would store them, and bring them out for the patrons when they visited. This was the level of fancy in this place. Margaret and I got a table for two in the slightly less fancy section, a room where the tables were bare dark wood. There was another room which was evidently fancier, as the tables in there all had crisp white tablecloths on them. We ordered one of the famous Keens "mutton chops" to share. This is actually a cut from an older lamb, so still fairly tender, rather than serious old mutton. A man sitting at a table near us explained about the meat, and a bunch of other things about the restaurant. Margaret said he must come here often, and he said he ate there roughly once a week! 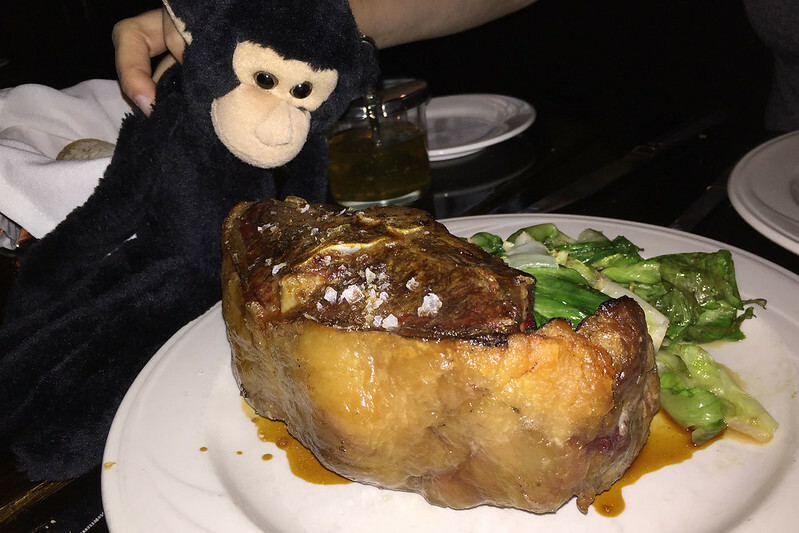 When the waiter took our order, he asked if we wanted the chop sliced for easier eating, but Margaret and I decided to have it left on the bone for the "full experience". The mutton chop was huge and I'm glad I didn't have to eat all of it. We also had a side of green beans, which, honestly, were cooked a little too soft for me - I prefer them really crispy. The meat was great though, very tender and flavourful. It came on a plate with what seemed to be sautéed lettuce, a little weird but actually nice with the sauce that was on it. To drink, I had to try the Keens ale, listed first on the beer list, as it was presumably brewed by the restaurant, or at least licensed under its name. It was a bit hoppy and very bitter, which worked well with the meal. 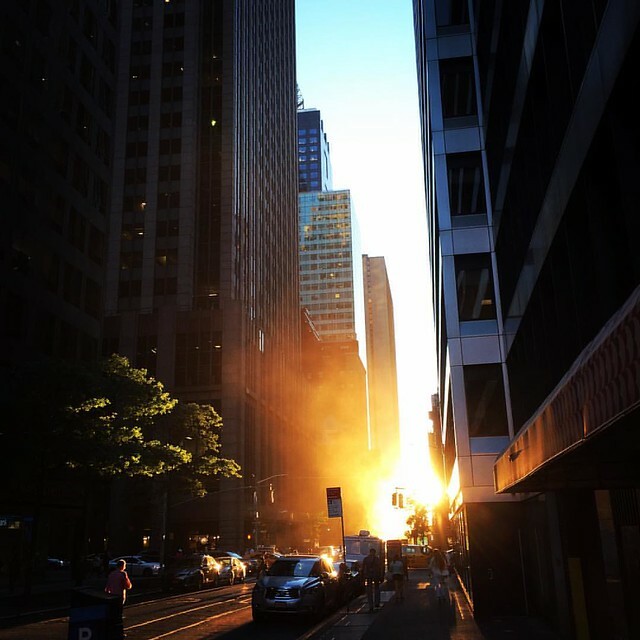 Sunset along the Manhattan streets. Despite declaring herself so full that she couldn't even think about dessert, Margaret took one look at the dessert menu and decided to order the red berry bibble, which was a sort of compote with a cream topping. I decided to try a piece of key lime pie, which I have heard much about but never tried before. There was a layer of white stuff on top which I assumed to be soft meringue, similar to a lemon meringue pie, but it turned out to be basically a thick whipped cream. The pie underneath was rather like a lime cheesecake, with a crumbly biscuit base. It was tangy and lime flavoured and all very nice, even if a bit different to what I was expecting. After dinner I returned to the hotel around 19:30, to find M. asleep. She woke up after a while and declared she wanted to go out to get some dinner. So I went out again with her. 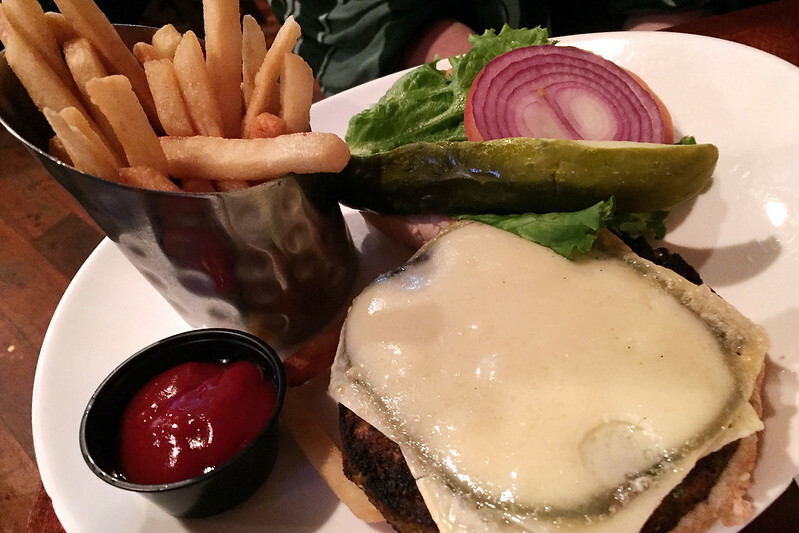 We found Connolly's Irish pub on 45th Street, and M. ordered a veggie burger, which came with grilled mushrooms and Swiss cheese on it. To drink she had a cosmopolitan cocktail, while I tried a Blue Moon beer from Belgium, which had a nice hint of orange citrus sweetness to it. After having her dinner, we walked back to the hotel to get a relatively early night, before I have to get up at 07:00 for an 08:00 start to the meeting tomorrow! Last updated: Tuesday, 23 August, 2016; 04:09:36 PDT.